Director Christopher Nolan’s dramatic re-envisioning of the Batman franchise comes to a thundering end with “The Dark Knight Rises,” a spectacular noir epic that’s equal parts murky, bloated, flashy and triumphantly cinematic. Four years after Nolan’s “Batman Begins” sequel “The Dark Knight” rattled audiences with a similar audiovisual overload, the new movie falls into the same rhythm and remains viscerally satisfying even when the story falters. Once again, Nolan’s monolithic take on Batman is a jarring, fractured experience fraught with tension right through its daringly open-ended conclusion. Among the recent spate of superhero blockbusters, Nolan’s Batman movies have stood out for conveying both mature direction and fiercely intellectual screenplays, but they move so quickly that it’s often hard to tell if they earn the pervasive reverence. At the end of the day, the three movies follow the same formula, blending dreary CGI spectacles with grave pontifications and brutal action. People scowl and whisper as often as things blow up, which in these times is something of a Hollywood anomaly. “The Dark Knight Rises” comes closer to deepening the pathos of its brooding, costumed lead, mainly due to the climactic incidents that bring the story to a firm conclusion (even as it leaves room for fresh beginnings). 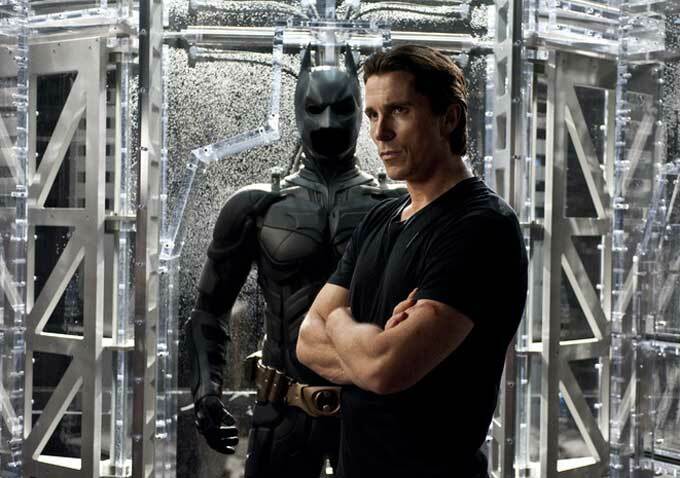 With a grisly twist that puts Batman out of commission for large portions of the movie, “The Dark Knight Rises” hardly qualifies as a superhero movie by the usual standards, which may have been Nolan’s intention from the start. Beneath the layers of moral pontification, however, “The Dark Knight Rises” finds Batman racing against time to stop the Darth Vader-like super-terrorist Bane (Tom Hardy, his face mostly obscured by a metallic vent) from detonating a nuclear bomb set to destroy Gotham City. However, this is preceded by a barrage of developments that pile up so relentlessly that even Nolan — again co-writing the screenplay with his brother Jonathan — struggles to define who’s doing what and why. Nolan’s storytelling is undeniably serious but never quite sober. Nevertheless, “The Dark Knight Rises” deserves credit for having the gall to speed right out of the gate and never fully slow down. Batman (Christian Bale, more bleary-eyed than in previous installments) has gone off the grid before the movie even begins. Early scenes establish that a full eight years have passed since the conclusion of “The Dark Knight,” which found Aaron Eckhart’s erstwhile good-natured district attorney Harvey Dent transforming into the ghoulish Two-Face and dying in a violent confrontation. With the city assuming Batman was to blame, Wayne retired his alter ego and settled into Charles Foster Kane-like seclusion in his mansion. He has lost the will to make a difference. Mirroring that downward spiral, reliable Batman pal Commissioner Gordon (Gary Oldman) has been downgraded by Gotham City fat cats to the status of a reckless warmonger in peacetime. Like Batman, his influence has faded, but duty inevitably calls both men back to action. That decision, of course, takes time, but at two hours and 40 minutes, “The Dark Knight Rises” has plenty to spare. Before even fleshing out its main villain, the Nolans introduce spry diamond burglar Selena Kyle, aka Catwoman, although the screenplay never identifies her by that name. Played by Anne Hathaway with a series of seductive glances, naughty grins and olympic combat, Hathaway’s take on the character exists a world apart from Michelle Pfeiffer’s latex-covered cartoon in Tim Burton’s “Batman Returns,” a decision that results in a more believable creation but also an unmemorable one. This has been a frequent problem with Nolan’s gritty realist approach to the blockbuster mold, which frequently trades overstatement for sleek displays with mixed results. While Hathaway’s character is something of a letdown, Batman’s new foe Bane provides a supremely menacing creation. An early scene that introduces the mythological character, a former overseas prisoner raised by Batman’s ex-trainer-turned-nemesis Ra’s al Ghul (Liam Neeson in “Batman Begins”), outdoes everything that comes next. Tricking a group of headhunters into kidnapping him, Bane takes down an entire plane and escapes with a prisoner in a deft mid-air antic that borders on the balletic. Easily outdoing the heist sequence that opened “The Dark Knight,” it quickly establishes the extent of his demonic power. Still, Bane’s personality leaves much to be desired, mainly because he’s so hard to hear beneath his silvery muzzle. Bane’s muffled voice embodies the movie’s strengths and weaknesses at once. He’s an ominous terror, to be sure, but also largely undefined and remote. Nolan’s direction seemingly takes cues from Bane: “Now is not the time for fear,” Bane tells a captive in an early bit. “That comes later.” So we keep waiting: While “The Dark Knight Rises” hovers in a constant state of dread, it can be awfully difficult to follow each moment or care about the big picture. Is there payoff? Not so much as individually absorbing moments. Batman gets beaten to a pulpy mass in a brutally choreographed mano-a-mano with Bane in Gotham City’s sewers, and the face-off puts the hero out of commission for the lengthy second act. His recuperation scenes, set in a dungeon filled with worldly prisoners who become his allies, goes on and on like some kind of spiritual masterclass. Unlike Nolan’s “Inception,” which used its narrative momentum to dive through multiple layers of consciousness, “The Dark Knight Rises” feels simultaneously speedy and lethargic, with plenty of unremarkable cutaways and exchanges given unnecessary weight thanks to Hans Zimmer’s routinely invasive score (which, like Bane’s mask, often makes the dialogue inaudible). The Zimmer score is matched by IMAX-friendly images of Gotham’s cityscape seen from a bird’s eye view as its inhabitants fall prey to Bane’s gradual takeover. The explosive CGI has its moments, with Batman’s new airplane — The Bat — adding the latest toy to the series, but Nolan relishes destruction more than the forces challenging it. Bane’s decimation of entire football field with the push of a button has far greater impact than any of Batman’s achievements, which makes you wonder where the filmmaker’s sympathies truly lie. When our ostensible hero does snap back into action, he’s less a force of vengeance than a brash machine. “I’m not afraid,” Batman growls. “I’m angry.” No matter the scale of the Batman movies, their protagonist still comes across as a thin creation. And in “The Dark Knight Rises,” he’s not alone. New additions include Joseph Gordon-Leavitt as a muckraking police officer whose history with Wayne allows the younger man to convince Batman he’s still worth a damn, but his powers of persuasion ring hollow even when the character grows central to larger events at hand. Marion Cotillard surfaces in a few scenes as a potential Wayne love interest whose true motives arrive later on to bring the arc of the three movies full circle. But she’s too underdeveloped to earn that entitlement. Only Michael Caine, as trusty butler Alfred, stands out with a series of desperate monologues urging Wayne to keep himself safe. Caine overpowers Batman better than Bane himself to emerge as the movie’s true soul. That “The Dark Knight Rises” manages to have any soul at all speaks to its lasting value. Unquestionably the strongest entry in the series, it should go down in history not for its distracting flaws but rather the continuing defiance of big movie clichés: It has few cheesy one-liners or sudden, cheap jolts, slo-mo shots or absurd virtual camera movement. The action props up the atmosphere rather than mowing it down. Beyond that, Nolan’s choice for a conclusion messes with our assumptions in accordance with the same coy, methodical process Nolan brought to the climaxes of “Memento” and “Inception.” As original properties, those movies brought fewer expectations to the table. The finale to “The Dark Knight Rises” will undoubtedly infuriate some viewers and perplex many more, but for that same reason the movie will stick with them. That’s an appropriate takeaway: Viewed as a whole, Nolan’s trilogy is enticing and frustratingly obtuse in equal measures, not unlike Batman’s homegrown moral code. HOW WILL IT PLAY? Already set to break box office records, “The Dark Knight Rises” will perform well around the country for weeks on end once it opens July 20 nationwide. The real question is whether it can maintain that moment during awards season.